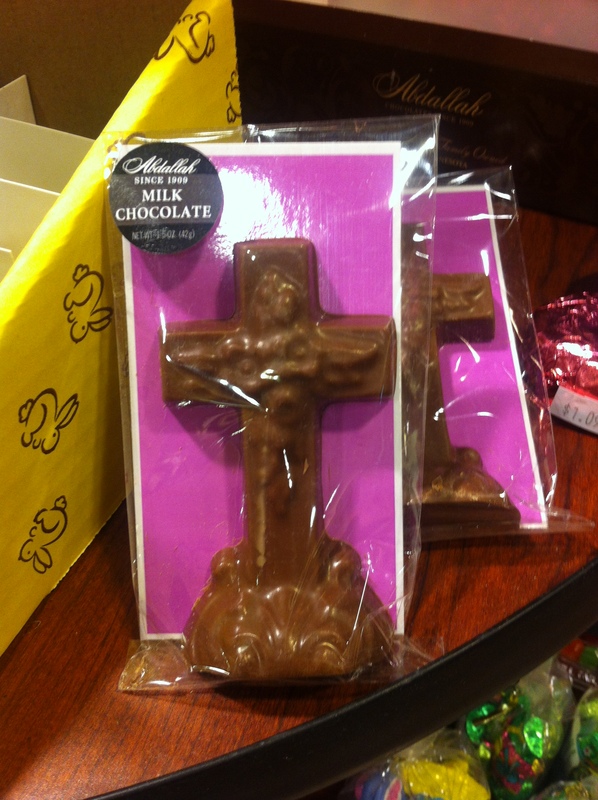 While at the checkout counter at a local grocery store last week I noticed a chocolate cross for sale as Easter candy. Made by a well-known local chocolatier, Abdallah, it immediately it struck me as curious. I suppose the sweet object could be interpreted as a creative extension of the chocolate Easter bunny into the realm of religious observance. As religious icon the cross is a powerful religious symbol—indeed evoking the death and ascendence of a God—the cornerstone of Christianity. Fashioning it as chocolate kitsch seems wildly inappropriate. As a archaic form of torture and capital punishment a chocolate cross as a source of sweet pleasure at Easter seems no less bizarre. One of my students noted that it is a perfect example of the “extensification” of meanings of sugar consumption that Sidney Mintz describes in his classic book, Sweetness and Power.